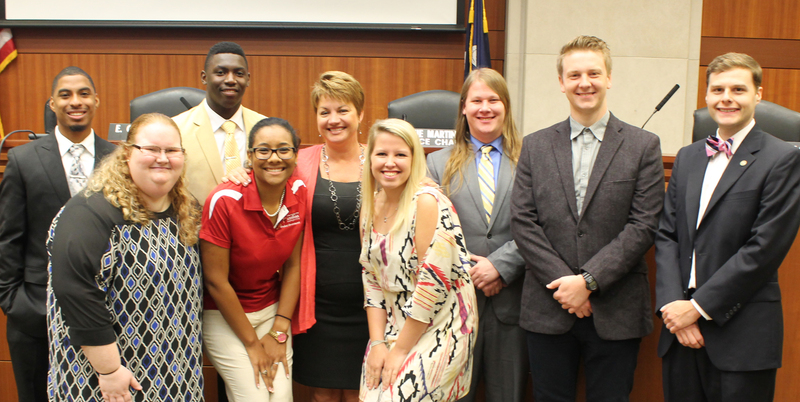 New UL System student government presidents met today in Baton Rouge to represent their campuses for the first time as members of the UL System Board’s Student Advisory Council for 2015-16. Recently, student leaders represented their campuses and the system at the Legislature for ULS Day at the Capitol, which showcased the system and its universities. “Our students and student government leaders were front and center–even in the House and Senate chambers and in committee meetings. You’re our best ambassadors, and we count on your input. Thank you for your service,” Dr. Woodley said. New SGA presidents include: Jonathan Wallace of Grambling; Maggie Brakeville of Louisiana Tech; Marvin Block of McNeese; Lillie Bourgeois of Nicholls; Matthew Whitaker of Northwestern; Alexis Quakenbush of Southeastern; Kirsten Allen of UL Lafayette; Marc Calhoun of ULM and Joy Ballard of UNO. UL System Board Chair Gerald “T. Boy” Hebert welcomed new student member Maggie Brakeville to her first regular board member and assigned her to committees. The Louisiana Tech student government president will serve on the Academic and Student Affairs, Personnel, and Strategy and Performance committees. Brakeville’s one-year term began June 1, which afforded her the opportunity to participate in Grambling Presidential Search interviews and the Special Board meeting June 4 that resulted in the naming of Grambling’s new president. The National Collegiate Athletic Association recently released its annual report on the academic progress rates (APR) of all NCAA Division I teams, including those of the nine UL System campuses. Reports are available at http://www.ncaa.org/about/resources/research/academic-progress-rate-search. Teams calculate their APRs based on the eligibility, graduation and retention of each scholarship student-athlete, with those scoring below certain thresholds facing possible consequences, such as practice restrictions and restrictions on postseason competition. Rates are based on the past four years’ performance. Woodley said, as a whole, UL System institutions and athletic teams performed well and should be commended. Grambling was the only UL System campus with a team falling below the threshold. The issue with the school’s Women’s Basketball program is currently being addressed by the Interim Athletic Director. 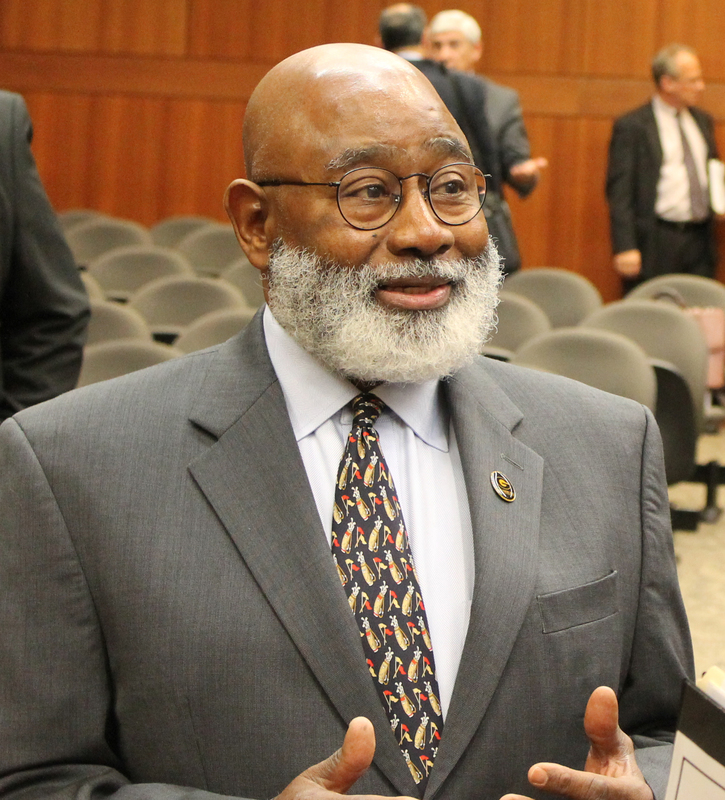 The Board and Dr. Woodley congratulated Dr. Willie Larkin, and offered him full support, as he prepares to take office as Grambling President on July 1. She and Board Chair Gerald “T. Boy” Hebert also thanked Dr. Cynthia Warrick, who has served as Grambling’s Interim President over the past 11 months, doubling the university’s fundraising and addressing many critical issues. McNeese’s approval to enter into a Cooperative Agreement between Jiangsu Normal University of The People’s Republic of Chinea University and McNeese State University. Northwestern’s approval of a Letter of Intent to offer a Master of Science degree program in Industrial Management (MSIM). Northwestern’s approval of a Letter of Intent to offer a Doctor of Arts degree program with a Concentration in National Security Leadership (DA-NSL). Northwestern’s approval of a Proposal for a Bachelor of Applied Science degree program in Resource Management (BASRM). UL Lafayette’s approval of a Letter of Intent to offer a Master of Science degree program in Informatics. ULM’s approval of a Proposal for a Post Baccalaureate (PBC) in Mortgage Analytics. UNO’s approval of a Proposal for a Certificate in Performing Arts Management. Grambling’s approval of a Revised Complimentary Ticket Policy. McNeese’s approval of a contract with Ms. Helena Besovic, Head Women’s Tennis Coach, effective July 1, 2015. McNeese’s approval of a contract with Mr. Andrew Burk, Jr., Head Golf Coach, effective July 1, 2015. McNeese’s approval of a contract with Ms. Ashleigh M. Fitzgerald, Head Women’s Volleyball Coach, effective July 1, 2015. McNeese’s approval of a contract with Mr. Michael E. Fluty, Head Women’s Golf Coach, effective July 1, 2015. McNeese’s approval of a contract with Mr. Brendon J. Gilroy, Head Men’s and Women’s Track Coach, effective July 1, 2015. McNeese’s approval of a contract with Ms. Joanna F. Hardin, Head Women’s Softball Coach, effective July 1, 2015. McNeese’s approval of a contract with Mr. Justin W. Hill, Head Baseball Coach, effective July 1, 2015. McNeese’s approval of a contract with Mr. Ronald P. Savoie, Head Women’s Soccer Coach, effective July 1, 2015. McNeese’s approval of a contract with Mr. Dave Simmons, Head Men’s Basketball Coach, effective July 1, 2015. McNeese’s approval of a contract with Mr. Bernard M. Viator, Head Football Coach, effective July 1, 2015. McNeese’s approval of a contract with Ms. Brooks Donald-Williams, Head Women’s Basketball Coach, effective July 1, 2015. Southeastern’s approval of a contract with Mr. Blake Williams, Football Defensive Coordinator, effective July 1, 2015. UL Lafayette’s approval of a contract with Mr. Tony Robichaux, Head Baseball Coach, effective July 1, 2015. ULM’s approval of a contract with Mr. Nathaniel Brown, Assistant Football Coach, effective July 1, 2015. ULM’s approval of a contract with Mr. Matthew Clark, Assistant Football Coach, effective July 1, 2015. ULM’s approval of a contract with Mr. Steve Farmer, Assistant Football Coach, effective July 1, 2015. ULM’s approval of a contract with Mr. John Mumford, Assistant Football Coach, effective July 1, 2015. ULM’s approval of a contract with Mr. Jason Nichols, Assistant Football Coach, effective July 1, 2015. ULM’s approval of a contract with Mr. Travis Niekamp, Assistant Football Coach, effective July 1, 2015. ULM’s approval of a contract with Mr. Mario Price, Assistant Football Coach, effective July 1, 2015. ULM’s approval of a contract with Mr. Adam Waugh, Assistant Football Coach, effective July 1, 2015. ULM’s approval of a contract with Mr. Cody Wells, Assistant Football Coach, effective July 1, 2015. UNO’s approval of several amendments to the contract with Ms. Keeshawn Carter Davenport, Head Women’s Basketball Coach, effective July 1, 2015. LA Tech’s approval to name certain areas within the multipurpose athletic training facility in the south end zone of Joe Aillet Stadium the Davison Athletic Complex, in honor of the Davison family and the late Paul M. Davison. Nicholls’ approval of a Memorandum of Understanding (MOU) with The Maxine Giardina Charter School, LLC and approval to lease approximately 1.92 acres in compliance with La. R.S. 17:3361-65 to locate a school on the campus. UL Lafayette’s approval of a resolution authorizing the Amended and Restated Ground Lease, authorizing amendment to prior bond documents as outlined in the resolution, and ratifying the prior approval of an Amended and Restated Collection and Disbursement Contract utilizing Ragin’ Cajun Facilities, Inc. (RCFI), a 501(c)3, not-for-profit corporation. UL Lafayette’s approval to allow the University President to act on behalf of the University of Louisiana System and enter into the agreements, covenants, conditions, and stipulations and to execute such documents as are necessary to properly effectuate the conveyance, sale, transfer, assignment or lease and delivery of title to the property described as Section 102, Township 8 South, Range 4 East of the Parish of Lafayette (Enterprise Center of Louisiana). LA Tech’s approval of a Cooperative Endeavor Agreement between the University and Louisiana Tech Research Institute, Incorporated. University of Louisiana System’s approval to authorize the Board Chair to create a Special Committee on Tuition and Fees and authorizes it to review and approve fees pursuant to House Bill 152 of the 2015 Regular Session of the Louisiana Legislature. University of Louisiana System’s approval to authorizes the Special Committe on Tuition and Fees to review and approve Undergraduate and Graduate Mandatory Attendance Fees and Non-Resident Fees for 2015-16 as required by LA GRAD Act by up to ten percent (10%). University of Louisiana System’s approval of System Universities’ Fiscal Year 2015-16 Internal Audit Plans. Grambling’s approval to appoint Dr. Obadiah Simmons, Jr. as Interim Athletic Director effective May 1, 2015. LA Tech’s approval to appoint Dr. Donald N. Schillinger, Jr. as Dean of the College of Education effective July 1, 2015. Northwestern’s approval to appoint Dr. Margaret Kilcoyne as Interim Dean of Business and Technology effective July 1, 2015. Northwestern’s approval to appoint Dr. Chris Maggio as Interim Vice President for Student Experience effective July 1, 2015.